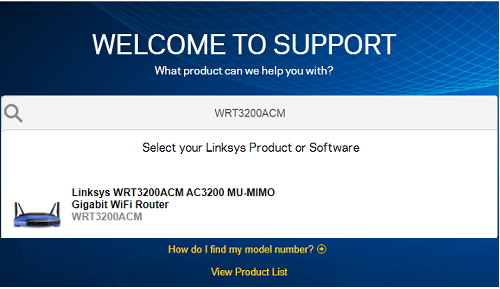 Look for your Linksys router below and click on its corresponding link to view or download the correct user guide. If the model number of your Linksys router cannot be found on the list, you can search for it by following the steps below. 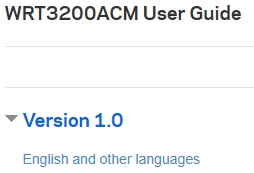 The Linksys WRT3200ACM is used as an example in the instructions below. Enter the model number of your device in the Search by Product Name or Model Number field and when it shows your device on the page, click the model number. Click the USER GUIDE PDF button to open and read the user guide. You can also right-click on the button and click Save link as... to save a copy of the file to your computer. 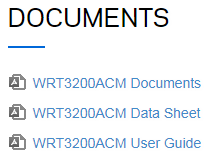 NOTE: You can also scroll down and click on the user guide for your router in the the DOCUMENTS section. When the link opens, select the correct hardware version of your device to open and view the user guide. You can also right-click on the user guide link and click Save link as... to save a copy of the file to your computer.